In probability theory and statistics, variance is the expectation of the squared deviation of a random variable from its mean, and it informally measures how far a set of (random) numbers are spread out from their mean. The variance has a central role in statistics. It is used in descriptive statistics, statistical inference, hypothesis testing, goodness of fit, Monte Carlo sampling, amongst many others. This makes it a central quantity in numerous fields such as physics, biology, chemistry, economics, and finance. The variance is the square of the standard deviation, the second central moment of a distribution, and the covariance of the random variable with itself, and it is often represented by , , or . A mnemonic for the above expression is "mean of square minus square of mean". On computational floating point arithmetic, this equation should not be used, because it suffers from catastrophic cancellation if the two components of the equation are similar in magnitude. There exist numerically stable alternatives. and where the integrals are definite integrals taken for ranging over the range of . 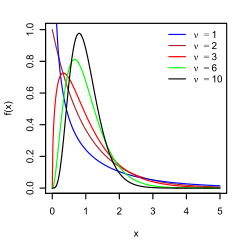 If a continuous distribution does not have an expected value, as is the case for the Cauchy distribution, it does not have a variance either. 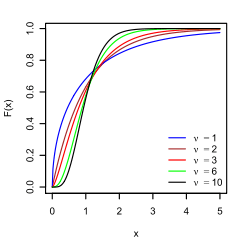 Many other distributions for which the expected value does exist also do not have a finite variance because the integral in the variance definition diverges. An example is a Pareto distribution whose index satisfies . where is the expected value, i.e. 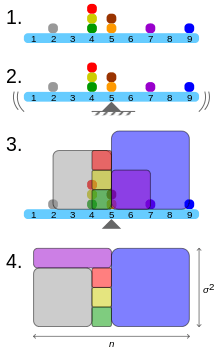 So for an exponentially distributed random variable, . The binomial distribution with describes the probability of getting heads in tosses. Thus the expected value of the number of heads is , and the variance is . Variance is non-negative because the squares are positive or zero. The variance of a constant random variable is zero, and if the variance of a variable in a data set is 0, then all the entries have the same value. Variance is invariant with respect to changes in a location parameter. That is, if a constant is added to all values of the variable, the variance is unchanged. If all values are scaled by a constant, the variance is scaled by the square of that constant. Here Cov(⋅, ⋅) is the covariance, which is zero for independent random variables (if it exists). The formula states that the variance of a sum is equal to the sum of all elements in the covariance matrix of the components. This formula is used in the theory of Cronbach's alpha in classical test theory. If is a scalar complex-valued random variable, with values in , then its variance is , where is the complex conjugate of . This variance is a real scalar. If is a vector-valued random variable, with values in , and thought of as a column vector, then the natural generalization of variance is , where and is the transpose of , and so is a row vector. The result is a positive semi-definite square matrix, commonly referred to as the variance-covariance matrix. If is a vector- and complex-valued random variable, with values in , then the generalization of its variance is , where is the conjugate transpose of . This matrix is also positive semi-definite and square. ↑ Loeve, M. (1977) "Probability Theory", Graduate Texts in Mathematics, Volume 45, 4th edition, Springer-Verlag, p. 12. ↑ Sharma, R. (2008). "Some more inequalities for arithmetic mean, harmonic mean and variance". J. Math. Inequalities. 2 (1): 109–114. doi:10.7153/jmi-02-11.